Susan D. Hudson, PhD, has been an educator, consultant, and practitioner in the field of leisure, youth and human services for over 39 years. She is a McElroy Professor, one of only three such endowed professorships in the country, and the former Education Director for the National Program for Playground Safety. 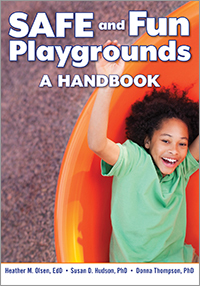 This handbook is what you need to create pleasing and challenging playgrounds that are safe, but not boring. Softbound, 176 pgs. E-book available.